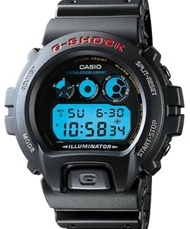 The Casio® G-Shock Illuminator® has battle-proven advanced technology and design that sets the World-Class G-Shock apart from the competition. Developed for full, heavy-duty use: can be worn during motocross, chainsaw operation, rock drill operation, you name it! Illuminator backlighting function is brighter than Indiglo® and continues to glow bright blue for 3 seconds after the on button is released. G-Shock Classic Watch featuring Shock resistance, 200M WR, countdown timer, 1/100 sec. stopwatch and auto-calendar. 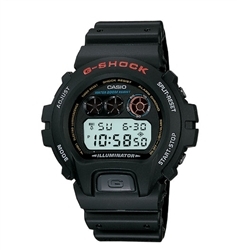 Black resin band digital watch with neutral face.The watch to wear when the going gets tough!